Back cover blurb: Graham Cavanaugh’s second wife, Audra, is everything his first wife was not. She considers herself privileged to live in the age of the hair towel, talks non-stop through her epidural, labour and delivery, invites the doorman to move in and the eccentric members of their son’s Origami Club to Thanksgiving. She is charming and spontaneous and fun but life with her can be exhausting. In the midst of the day-to-day difficulties and delights of marriage and raising a child with Asperger’s, his first wife, Elspeth, reenters Graham’s life. Former spouses are hard to categorize – are they friends, enemies, old flames, or just people who know you really, really well? Graham starts to wonder: How can anyone love two such different women? Did he make the right choice? Is there a right choice? Audra is Graham Cavanaugh's second wife and Mother to their son, Matthew a sufferer of Asperger's. Audra is fun, pretty, quirky, chatty, optimistic and very likeable. Basically, she is everything that Elspeth, Graham's first wife is not. This is fine, Graham is content for them to be opposites, after all what attracted him to Audra, made him leave Elspeth for her. However when he bumps into is ex-wife, Audra is convinced that they should invite Elspeth into their life's and that the two woman should become friends. It is worth pointing out at this stage that Audra is pretty much friends with everybody. Graham isn't convinced, but he knows that Audra won't let it lie unless they invite Elspeth and her new partner around for dinner, and so they do, and Graham begins to wonder what it would still be like to be married to Elspeth. Meanwhile Matthew is obsessed with origami, and wants to be invited to an exclusive origami club, where only the best are allowed to be members. Luckily Matthew's talent speaks for itself and so Audra and Graham accompany their son to his origami meetings. Both of them want the best for their son, even if that means being driven totally insane by the other members of the origami club. To say they were an eclectic bunch would be a vast understatement. 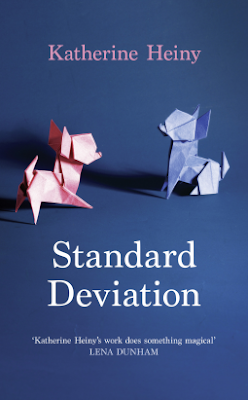 Standard Deviation is avaliable now via Amazon online and all good book shops.